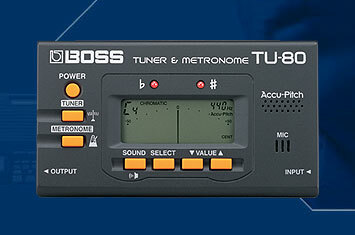 Supports chromatic tuning, plus 7-string guitars and 6-string basses- includes input & output jacks. Ultra-thin body fits easily into a guitar case or pocket. Dimensions: 5" w x 2 1/2" d x 1" h.
Metronome has 7 rhythms, 10 beats and cool animated LCD display - range 30-250 - Quarter note, Eighth rest & eighth note, Eighth note, Triple, Triple with center rest, Sixteenth note, Clave (3-2, 2-3), Beat: 0-9. Uses 2 A A batteries included-- approximately 100 hours of use. Input Jack (1/4") for guitar, bass, external pick up for any instrument.